Life can't be all bad this fall what with the cheering thought of Cher singing Abba in the album Dancing Queen, out September 28. Listen to GIMME! GIMME! GIMME! (A Man After Midnight) here. 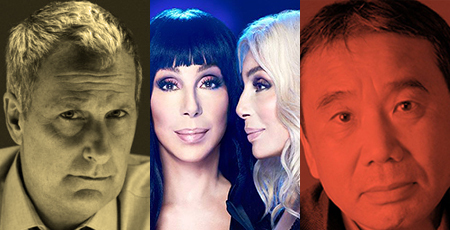 For those who want to binge, The Cher Show, a new musical biography, starts November 1 at the Neil Simon. And from the cheering to the sublime, Renee Fleming releases Broadway, an album of works by Bernstein, Rodgers, Sondheim and many others. The inestimable Haruki Murakami is all over the geographical, temporal and psychological map, as ever, in his new novel Killing Commendatore, in which The Great Gatsby also figures prominently. Available October 9. It's been nearly three decades since the last major Andy Warhol retrospective in the U.S. and the Whitney obliges with Andy Warhol —From A to B and Back Again, opening November 12. Broadway's prestige production this fall is the play version, by Aaron Sorkin, of Harper Lee's To Kill a Mockingbird. Directed by Bartlett Sher, it stars Jeff Daniels and begins previews November 1 at the Shubert.